One last movie for the Christmas season, albeit just a bit after-the-fact, before we move on to non-season-specific fare for another year. Of course, 2005’s Kiss Kiss Bang Bang is a Christmas movie only in the sense that Die Hard is a Christmas movie — which is to say, it takes place at Christmas time, and there are a few visual references and songs used, but there’s not really anything to do with Christmas in the film and it could just as easily have been set in mid-June. But that’s all right. Hundreds of bloggers seem to be putting Die Hard up at the top of their “top Christmas films” lists, inappropriate though it really is, so if it’s fair for them, it’s fair for me to lump this in with the Christmas cinema. After all, I did move it up on my schedule simply from hearing it was set at Christmas time, so while I wouldn’t classify it as a Christmas movie, it’s close enough for just after Christmas. Besides, it does feature Michelle Monaghan in a skimpy Santa dress. Die Hard didn’t have that. The film’s main reference to Christmas, not that I’m complaining. 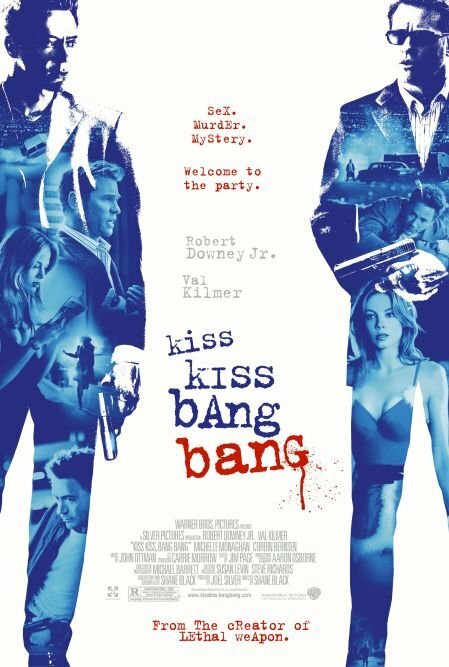 Kiss Kiss Bang Bang stars Robert Downey, Jr. as Harry Lockhart, a small-time appliance thief who accidentally finds himself hired as an actor when he crashes an audition following a burglary gone wrong. He’s hired to play the role of a detective, and — in the belief that he’s a method actor — his director has hired a private investigator, Perry van Shrike (Val Kilmer) as a consultant and instructed Harry to tag along on Perry’s cases for a while. The interplay between these two actors is hilarious. Downey is playing the neurotic imbecile he does so well, and also narrates the film in a self-aware parody of film noir — and does so with amusing ineptitude. Kilmer is sharply acerbic as “Gay Perry”, disabusing Harry of the romantic images he has of the life of a private investigator, and constantly belittling his poor decisions, assumptions, and word choices. But even Perry finds himself a bit out of his depth when their routine “follow and film” case puts them in the right place to see a car with a dead woman plunge into a lake. Don’t you just hate surprise guests for Christmas? The dead woman turns out to be the daughter of Harlan Dexter (Corbin Bernsen), the Hollywood mogul whose party Harry and Perry had attended the previous night. Harry and Perry end up embroiled in the case against their better judgment, due to an attempt to frame Harry for the crime. Complicating matters further is Harry’s childhood crush, Harmony (Michelle Monaghan), who had also been at the party and — thinking Harry is a real detective — wants to hire him to investigate the apparent suicide of her younger sister. Harmony, an actress on the verge of being a never-was, is clearly jaded by her lot in life, but has a kind of back-and-forth cynicism/faith dynamic regarding her childhood friend: she frequently seems to feel that Harry has or will let her down, but she keeps going back to him to solve the case. Monaghan and Downey have a good on-screen chemistry that helps sell this dynamic, where the characters — childhood friends who haven’t seen each other in years — don’t seem to know just how much they actually know each other now. There is trust between them, but they’re aware it’s a trust built on events long past. Kiss Kiss Bang Bang is a modern pastiche of old pulp detective novels, and it’s chock full of references to Raymond Chandler and other classics of the genre. The mysteries are twisted, the motives seedy, the heroes unsure of themselves but putting up a good front before other people. Just like P.I. stories of old, Harry and Perry need to clear themselves of the very crime they’re investigating. Just like the old stories, very little is ever quite what it seems. And just like the old stories, there are two guys dogging our heroes’ every move; played by Dash Mihok and Rockmond Dunbar, the two thugs who are only identified as “Mr. Frying Pan” and “Mr. Fire” are both just a little menacing but mostly quite funny as they try and fail to make tough-guy talk when they’re on screen. There’s plenty of action along the way, even though none of the three leads are playing the action hero here. Harry’s a scrawny man who never learned to fight, Perry’s overweight, and Harmony is just an actress. None of them are prepared to be running around getting shot at, but that’s where they find themselves. A key factor in intimidation is not to get into a semantic argument with your victim. Kiss Kiss Bang Bang seems to have flown under a lot of peoples’ radars; it only barely made back its budget, and only based on the worldwide release, not domestic. But this is a great film and deserves some attention. There are a lot of funny lines and funny scenes in this movie that had me laughing out loud; it’s a dark comedy, but it’s a good one. It succeeds on all other fronts as well; the mystery is engaging, believable, and although it’s not quite a “fair play” mystery (i.e., one where the audience can figure it out with sufficient attention), it’s actually pretty close, and in that respect is true to the spirit of the pulp fiction novels where there were usually key twists to keep the audience guessing. The twists here, at least, are perfectly logical once seen in hindsight. And the chemistry between the three leads is great; whether it was Kilmer and Downey or Downey and Monaghan or Kilmer and Monaghan or all three together, their actions and responses all felt perfectly natural. This movie is great fun, and if you’re a fan of old pulp heroes such as Sam Spade and Phillip Marlowe, this modern affectionate parody is well worth checking out. This entry was posted in Christmas Cinema and tagged 2000s, 5 Stars, Corbin Bernsen, Dash Mihok, Kiss Kiss Bang Bang, Michelle Monaghan, movies, reviews, Robert Downey Jr., Rockmond Dunbar, Shane Black, Val Kilmer. Bookmark the permalink. It’s a keeper, that’s for sure. And although any mystery loses some of its luster on repeat viewings (you can only be surprised once), I think this one is likely to hold up pretty well. A solid movie for anytime, but yes the Santa elements are there. This one is like a leather jacket on the Fonz; there’s so much style here and the whole pic is very cool. This has a great story and strong cast. Indeed, it’s a very stylish film, and a lot of fun. And the cast is the main reason for its success; without Downey or Kilmer this would have been a very different film, and probably not as good, and Monaghan is only slightly less important.